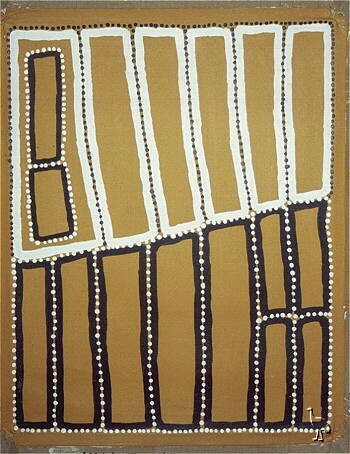 Walala was born in the region of Wilkinkarra (Lake Mackay) in the Western Desert. In 1984, Walala and several other Pintupi people made first contact with present-day Australian society. They moved to Kiwirrkurra, a remote community in the Gibson Desert. In 1997, encouraged by his brother Warlimpirrnga (a very well-known painter) he began to paint in a minimalist style reminiscent of engravings on weapons, sand paintings and ritual body painting. In his art, he depicts the Tingari Cycle, a series of sacred and secret mythological ceremonies describing the epic journeys of Ancestors in the Tjukurrpa (Dreamtime). A series of sculptures were made as replicas of his paintings. 1997 14th National Aboriginal and Torres Strait Islander Art Award, Darwin; 1998, 2000 Coo-ee Gallery, Sydney; 1998, 2000 Vivienne Anderson Gallery, Melbourne; 1998, 1999, 2000 Fire-Works Gallery, Brisbane; 1998 Japingka Gallery, Fremantle, Perth; 1998 15th National Aboriginal and Torres Strait Islander Art Award, Darwin; 1999 Fine Arts Museum of San Francisco, USA; 1999, 2001 Rebecca Hossack Gallery, London; 1999 Alliance Francaise de Canberra and French Embassy, Canberra; 2000 Stephane Jacob, Paris, France; 2000 Dar Festival Brisbane Powerhouse, Brisbane; 2000 Australian Heritage Commission, Canberra; 2000 17th National Indigenous Heritage Art Award, Canberra; 2002 Aboriginal Galleries of Australia, Melbourne; 2003 Chapel off Chapel Gallery, Melbourne. Art Gallery of NSW, Sydney; Flinders University, Adelaide; AMP Investments Australia, Sydney; Hasting Funds Management, Melbourne; Axiom Funds Managements, Sydney; Artbank; El Paso Energy International Co, Houston, USA; Kaplan & Levi Collection, Seattle, USA; The Kelton Foundation, Santa Monica, USA." From: Aboriginal Artists, dictionary of biographies by Janusz B. Kreczmanski and Margo Birnberg. 446pp.